This week we explored with oil. Morah Tzivie: What do we eat during Chanukah? Morah Tzivie: We eat things we cook in oil to remind us of the great miracle that happened. Zim: We light the menorah. Morah Tzivie: We do light the menorah to remind us of the 8 day miracle. Oil is an important liquid. Water is an important liquid. What happens when oil and water mix? 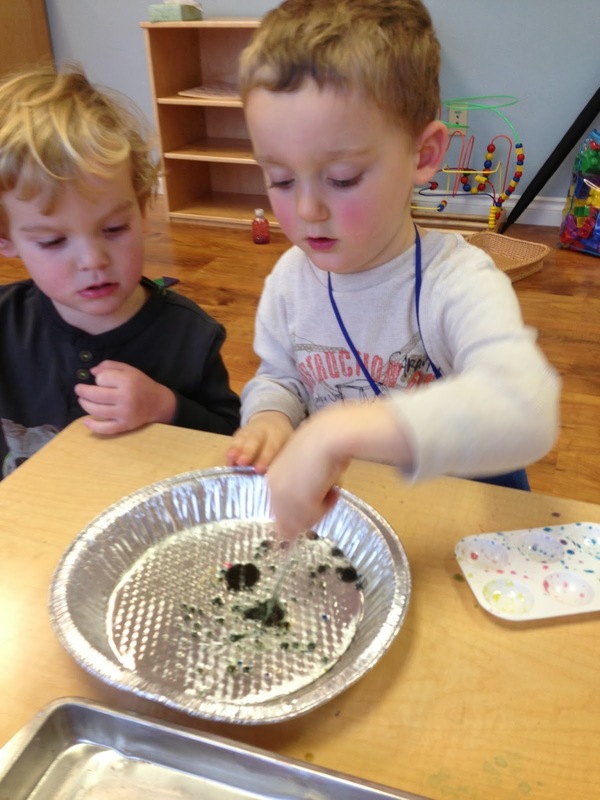 Our first experiment involved a thin layer of oil with drops of colored water. 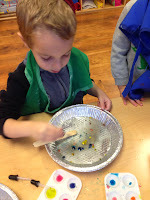 Efraim: It looks like a rainbow. Abigail: They are sliding around. Morah Katie: What is sliding around? Morah Katie: Why are the water drops not meeting each other? Efraim: The oil doesn't like it. Judah: I can make a big drop. Judah: Dropping the water on the water. It's black now. 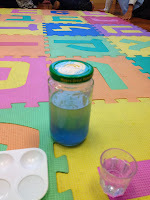 Our second experiment involved combining oil and water in a jar and shaking it up. Morah Katie: IF we shake it up, it should mix. Yes? Morah Katie: Wait it was Green!!! What happened? 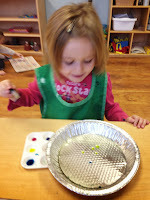 Gracie: The oil and water don't mix! 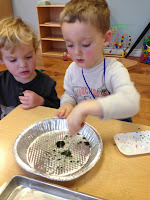 As an extension to our mixing experiment, we added salt to the oil and water. Morah Katie: Isaac, what is happening to your salt? 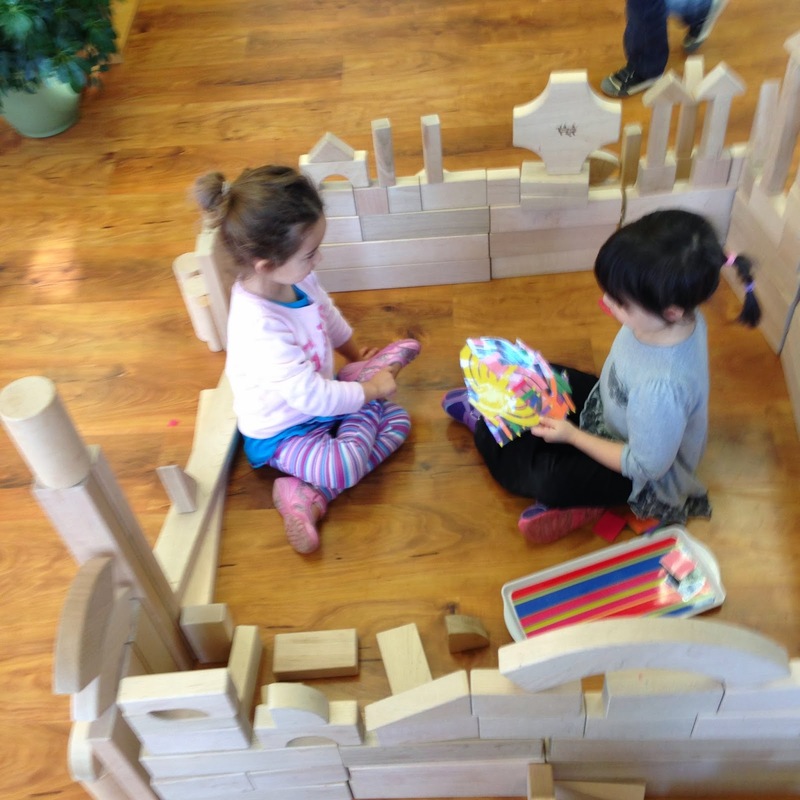 Morah Katie: What is it doing? 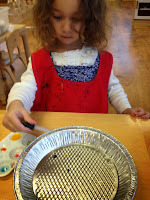 Morah Katie: It looks like the salt is at the bottom with some oil! 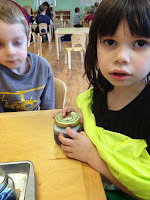 Morah Katie: When the water absorbs the salt, the oil floats right back up! 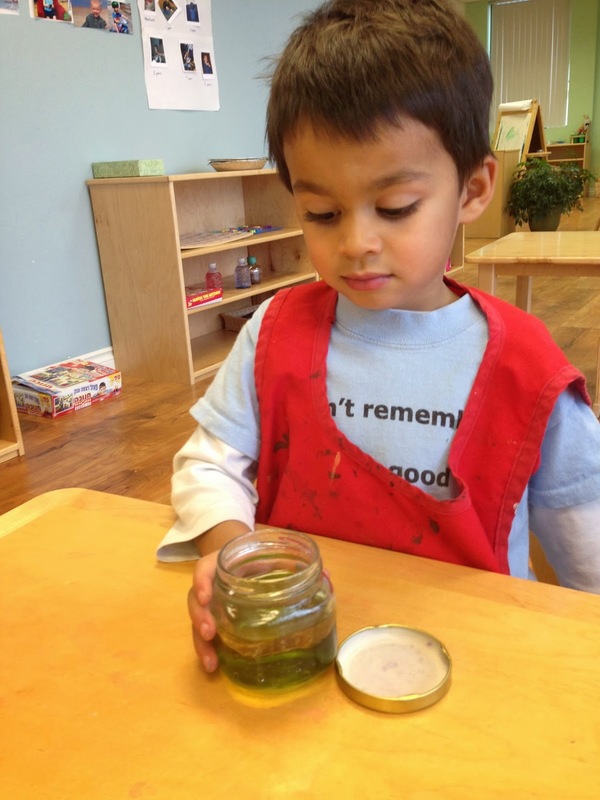 Our "third" experiment occurred after both previous oil experiments. 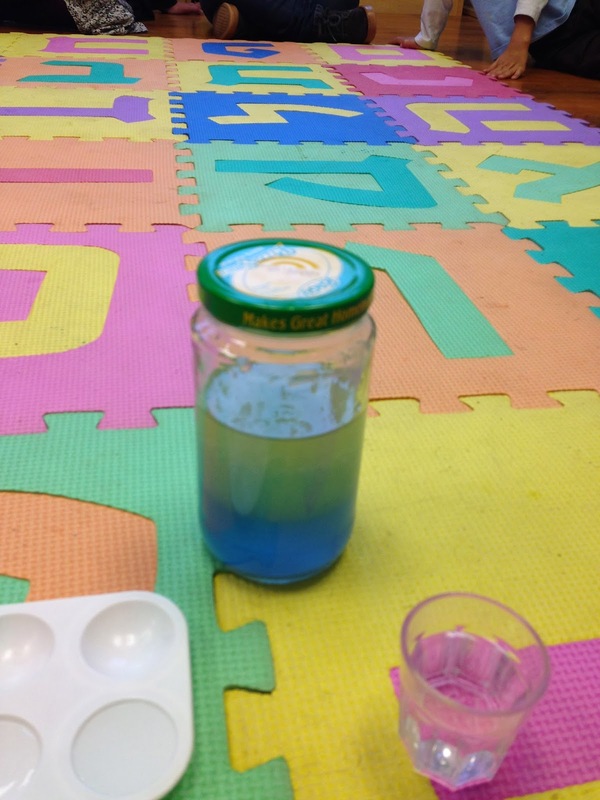 Soap makes oil and water mix. Morah Katie: Oil really likes to stay with oil, and water really likes to stay with water. When soap is added, oil and water come together just long enough to get washed clean. Efraim: The soap is making the oil stick. Sroil: It makes the oil bubbly. 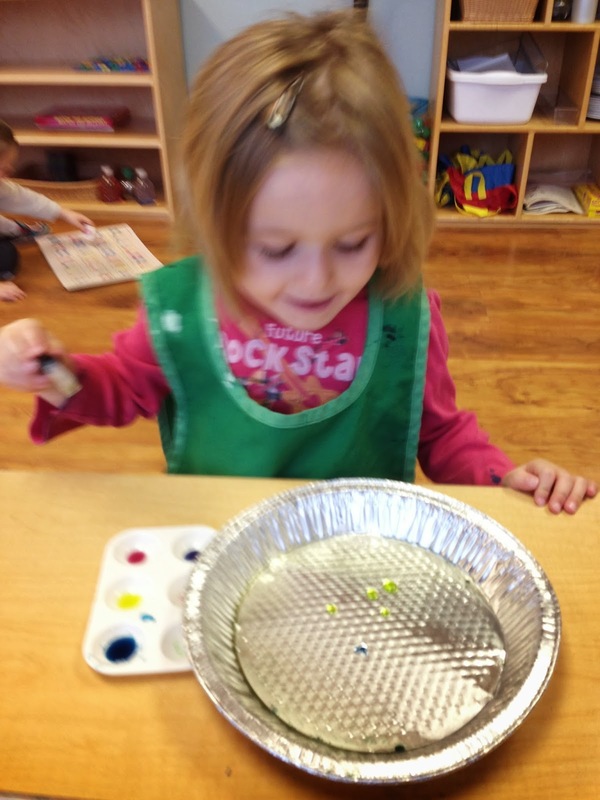 Sofia: It makes the soap green!